This time around, he's no rock star – he's just another small businessman. "When it gets to the point that inventory is piling up around you and you have tens of thousands of items crammed into every corner of the room, you finally get an understanding for just how important production management and storefront management are," exclaims Ashin. Sitting in the coffee shop of the Taipei Fine Arts Museum, the expression on his face is decidedly different from when he is discussing music – much of the leisurely assurance is missing, but added is a sense of freshness and risk. Over the past six months, this young man, lead singer of Mayday, one of the most popular bands in the Chinese-speaking world, has pored over a stack of business management texts that now towers four meters high. "I used to study art and music. I hated organization. I hated being managed. But now I can see that it's the only way to get close to my dreams," relates Ashin, his tone sounding much like the spring downpour outside the window, resigned yet full of anticipation. Ashin (Chen Hsin-hung) and Taiwanese graphic designer No 2 Good (Chen Bo-liang) launched their T-shirt-oriented pop clothing label "Stayreal" in May 2007 and followed that by opening their first Stayreal boutique on Taipei's East Side at the end of 2008. As the pair rapidly reached the break-even point on their six shops in Taipei, Taichung and Kaohsiung, in February of this year they formally entered the Hong Kong market, securing retail space in the trendy Silvercord Centre in Tsimshatsui, their first overseas outlet. The foray into the intensely competitive Hong Kong fashion market is the first real test for Stayreal, and plans are underway to open the label's first shop in Singapore at the end of this year. As for Tokyo, the Holy Grail destination of Asian fashion, that is still under consideration. Ashin and No 2 Good have each now had a taste of youthful success, classic examples of the new generation of younger Taiwanese starting their own labels – they're talented, they're dreamers and they're not afraid of the hardships involved in making it happen. "I like wearing T-shirts, and if you can wear T-shirts you've designed yourself, that's actually pretty cool," Ashin says. "Since we were kids we've been lining up to buy Japanese and American-branded stuff. Now, if we can design our own products, we want to have people line up for us," No 2 Good muses. Getting Mayday fans to line up for these guys is one thing, but winning the hearts of Japanese tourists in Ximending, and getting the hot South Korean boy band F.T. Island to wear their T-shirts in a music video – these are genuine achievements. Putting their academic credentials to work, Ashin, who majored in interior design at university, and No 2 Good, a graduate of National Taiwan Normal University's Graduate Institute of Design, are old pals dating back to their high school days. Just 34 years old this year, No 2 Good founded his Hosee Studio eleven years ago, specializing in graphic, webpage, multimedia and product packaging design. He has previously designed figurines and animated characters for such pop music acts as Fahrenheit and Stefanie Sun, as well as Mayday – interesting designs full of an individualistic style that have scored him a number of record company and advertising clients. In 2005, when electronics retailer BenQ named Mayday as its spokesgroup for the Greater China area, Ashin was struck with an idea and gave No 2 Good a call in the dead of night. During their conversation he asked No 2 Good to come up with a military dogtag-type design for an mp3 player. After their initial discussions, the two boldly approached then BenQ general manager for China Michael Tseng in Shanghai with their pitch. "Contrary to our expectations, Mr. Tseng was surprisingly supportive, and when it was finally mass produced, it sold 30,000 to 40,000 units," Ashin says. It was that experience that opened the door to their product design experience. "The biggest thing we learned was that thinking and talking were easy, but actually getting it done was tough," he says. But obstacles don't stand in the way of dreamers. From the testing-the-waters nature of their mp3-player design to their initial T-shirt concept, the "Kids' Dream" series, their experiences convinced the pair that the entry threshold for T-shirts was relatively low and that the product's visual nature was highly infectious. Furthermore, Taiwanese young people today are no longer so completely in the thrall of foreign brands, but increasingly favor local Taiwanese design and quality. So the two determined that launching their own label could be a feasible long-term endeavor. The creativity and design capabilities of the two entrepreneurs were a starting point. The style of Stayreal's T-shirts, shirts, jeans, hats and canvas bags are a cross of childlike innocence and purity with rock and antiwar sentiments. No 2 Good's "virtual reality" techniques, in particular, have today's Taiwanese kids playfully donning garments with images of gas masks, cameras, microphones and other objects that convey a sense of identity and attitude. Additionally, with the quality feel of their high thread-count 100 percent cotton, the T-shirts, which command prices in excess of NT$1,000, are still able to win the hearts of many young people, and nearly 30 percent of shoppers at the pair's boutique outlets are tourists from Japan, South Korea, Singapore and Malaysia. Early last year Sanrio, the Japanese company behind "Hello Kitty" then celebrating its 35th anniversary, contacted Stayreal with an interest in a joint venture, impressed with Stayreal's designs and product quality. "Actually, we're not terribly big fans of Hello Kitty, so we decided to play around with her a bit," Ashin says. Consequently, the pair came up with their exceedingly postmodern "Robot Kitty," a design that prompted even some guys to wear the iconic Kitty on their backs. Taiwan's former traditional background in the textiles industry, with its range of companies running the gamut of production scales, was quite naturally the most basic and convenient resource for the pair in seeking out raw materials and expertise. From the mock-ups, to cutting, printing and stitching, to packaging, Ashin and No 2 Good were no longer simply designers with sketches, designs and ideas, they were now full-fledged entrepreneurs controlling and managing the production process of their goods. "When we first jumped into this racket, we had no idea Taiwan had so many textile companies doing contract work for major international labels," No 2 Good says. "Of course, the big companies wouldn't take orders as small as ours, so we focused our search among small and medium-sized garment companies from Taoyuan and points north." But, he found that small and medium-sized textile firms had in the past focused largely on institutional uniforms and giveaway items. To them, clothing was a semi-disposable item, and aging and fading with washing were normal occurrences. They were somewhat in the dark as to the quality for which the "designer labels" were looking. "One time I went to a printing plant, and they were quite surprised, because they'd never had a designer show up to adjust the color scheme. The workshop was a big mess, but by going there, I could adjust colors on the spot with no need to keep sending stuff back and forth," No 2 Good says. The smaller shops were willing to take the smaller orders, and their shipping times were more flexible. Meanwhile, Stayreal consistently pressed its manufacturers to maintain quality control standards, and the two sides were able to arrive at an ideal cooperative arrangement, providing for mutual growth. "The big textile firms had their doubts about the stability of orders for our sort of Made-in-Taiwan label. So even when we were still in the talking stage, what we were hoping for was to ship world-class, quality fabrics from Taiwan to places all over the world," Ashin says with a smile. In fact, for some of Stayreal's more classic designs, demand has been in the tens of thousands of units, numbers that rival the big export orders. Ashin opens a sleek black cardboard box that looks like something out of a James Bond film. It turns out to be the packaging they send to customers who purchase three or more T-shirts online. Its intricate, cool design features several precision gadgets that Bond himself might carry. "We hope that when customers receive our products, they'll feel like they're getting a secret assignment from Stayreal, creating a tight bond," he says. Stayreal's success, it turns out, is not merely due to the popularity of Mayday. As business has gradually gotten on track, the company HQ has grown to 20 employees, moved into bigger digs and brought on local graffiti artist KEA as the company's third designer. They have also reprinted works by veteran comic artist Ah-Tui. Stayreal hopes to become a platform that can keep Taiwan's design prowess rooted firmly in Taiwan. 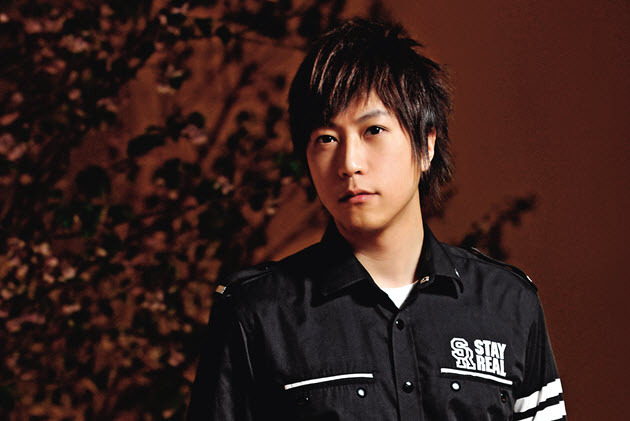 "I'm Ashin from Mayday, and when I tell people I want to create my own label in Taiwan, they'll believe me," he says. "But if I tell them I want to open shops in Tokyo and New York, they won't be so sure." 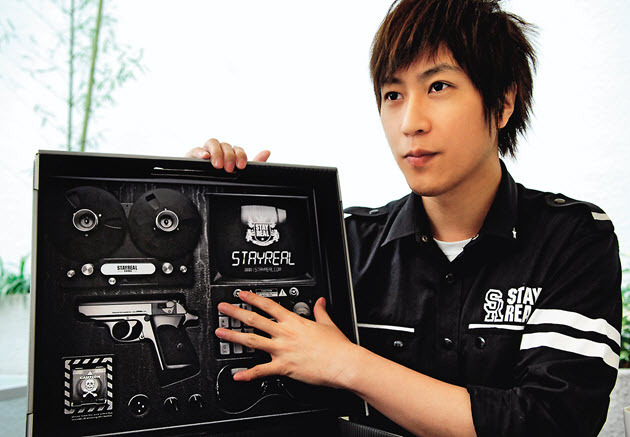 Following the establishment of Stayreal, Ashin has spent most of his time putting together his management team. The task he finds the toughest is convincing people of the validity of his "designer label dream." As it turns out, the musical path and the designer label dream are essentially similar, and Ashin has boldly risen to the task.